Just because it's the beginning of fall it doesn't mean you can't add a tropical fruit into your salad! Mango is one of my favorite tropical fruits. It's great for weight-loss, eye care, and if you don't like the taste of mango, you don't need to eat it to enjoy some benefits from it. You can apply it to your face for 2-3 minutes to clean out your pores. How great is that! Have you tried it? 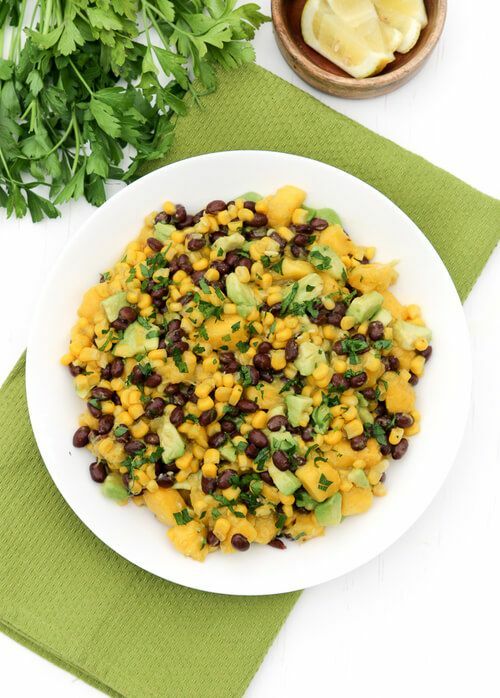 Top it off, this salad also benefits your digestive system (black bean health benefit) and improves your eye health because of the great amount of antioxidants in the corn. Peel and chop 1 mango and 1 Avocado into small squares. Drain water from 1 can of corn and 1 can of black beans, wash and add to avocado and mango. Add juice from 1/2 a lemon, 1 Tablespoon extra-virgin olive oil, a pinch of salt (or to taste), and 1 Tablespoon chopped fresh parsley.